Buy Cheap Social Reviews - Is Buy Cheap Social Reliable or A Scam? Buy-Cheap-Social offers a few different services for different social media platforms. 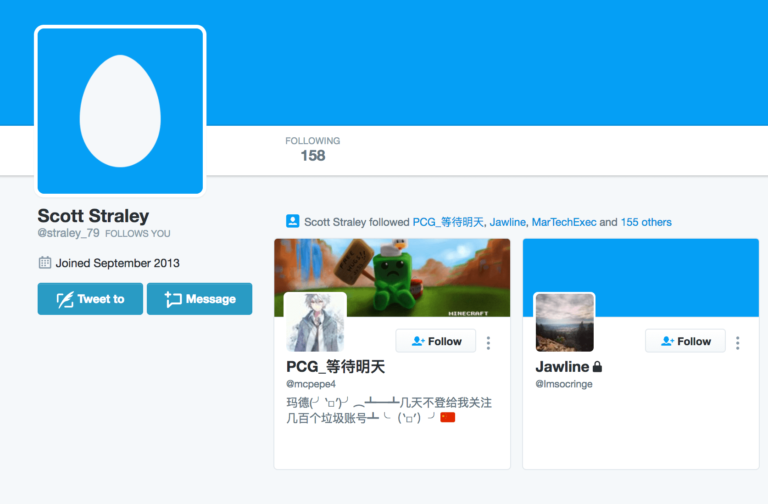 Their Twitter Follower packages are pretty affordable compared to other providers, but most of the followers we received don’t have uniques bios and are not active. Their website is informative and straightforward, and you can easily find what you need. However, we have not yet heard back from their Customer Support about some questions we had. Overall, Buy-Cheap-Social is recommended if you want to simply increase your follower count, without regard to the quality of the followers. Registered in Scottsdale, Arizona, Buy-Cheap-Social offers services for Facebook, Instagram, Twitter, YouTube and SoundCloud. Their website is very straightforward and informative. You’ll immediately see that they are focused on Facebook services, but you’ll find other social networks in the top nav bar. 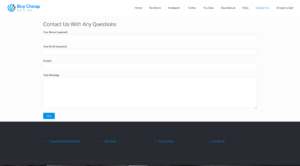 Navigation on their site is very easy, you can find links to a FAQ, and the Contact Page at the top-right of the page, and there’s also a Shopping Cart shortcut. However, their FAQ is focused on their Facebook service, and there’s relatively little info about the Twitter Follower service. 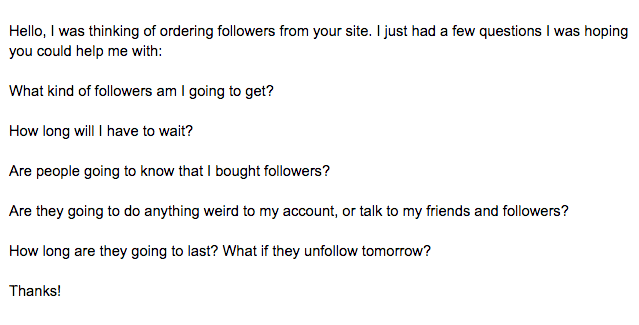 Buy-Cheap-Social has a refund policy, but there’s no information about what would happen if you lose followers. For Twitter, they offer Twitter Followers only. Buy-Cheap-Social has a standard Terms and Conditions. There is a 100% Money-Back Guarantee if you don’t get your followers five days after you place your order. There is no Retention or Replacement Guarantee. They only claim that Twitter will never remove the followers, but this is not completely reassuring. It’s easy to send a message to Buy-Cheap-Social. Just use the Contact Us link at the top-right of the page. You can reach them through the on-page contact form. Before ordering, we sent a set of questions to test their customer support. Unfortunately, we have not yet received a response to our questions. Twitter Followers from Buy-Cheap-Social will help you look more popular and attract more attention to your Twitter account. You won’t be gaining real followers, and they won’t look very good if anyone investigates closely. We first began seeing results within just a few hours. Our order was completed on time quite quickly, within 12 hours of ordering. 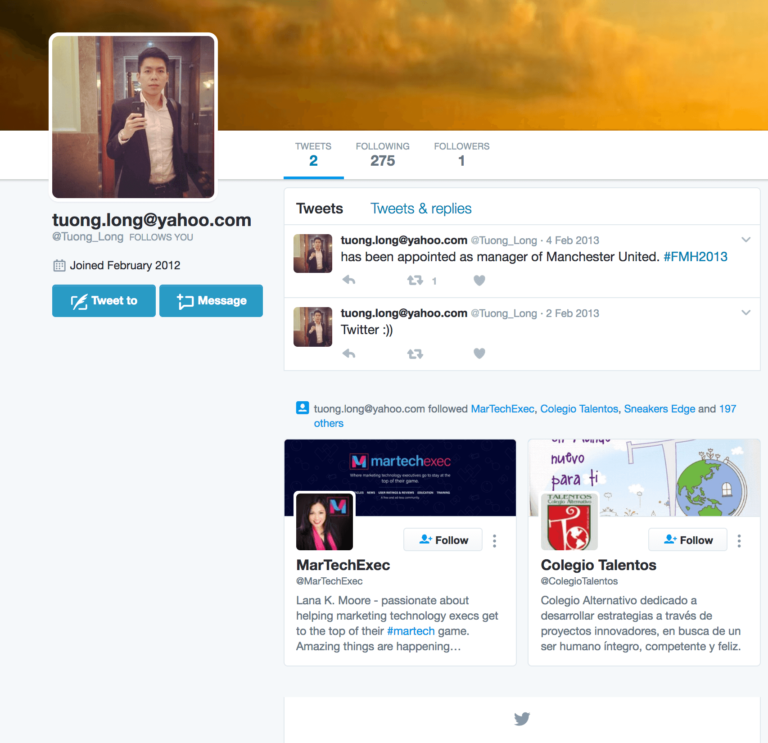 Most of the followers from Buy-Cheap-Social didn’t have profile photos or unique bios, and some are NSFW. They don’t actively tweet and they haven’t been engaging with your tweets. We ordered 1,000 Twitter Followers and they over-delivered at 1,237. We did lose followers, however, and at this time of writing we currently have 691 followers. Buy-Cheap-Social Media is a very straightforward site, providing a decent amount of information for customers. They delivered our 1,000 Twitter Followers on time, and even over-delivered. However, we have lost some since the order was completed, and our follower count has gone up and down quite a bit. The prices are affordable, but you’ll be getting low-quality followers that don’t look very authentic. On top of that, their customer service was unresponsive. Their services are recommended for people who want more followers but are on a budget. If you want to spend a bit more to get higher-quality Twitter Followers, read our list of Twitter follower providers which reviewed much better. My followers arrived within 36 hours of placing my order. The quality of followers was great with a majority having pictures and bios. The customer support was friendly and knowledgeable on issues regarding their services. The service delivered by these guys is way beyond the price they charge The whole process from the first point of contact which was their customer support to the delivery of the followers went on seamlessly. This is the perfect service for anyone looking to increase their twitter followers especially if you are on a budget. With 10$ i got more than 1000 followers. The numbers increased significantly after the followers i got from buycheapsocial attracted more organic followers. My business account on Twitter was on a wavy trend, the gain in followers was almost outdone by a countering loss. The service from their website got my numbers up, and now I comfortably maintain everything. This is a sure way of growing ones twitter followers in triple figures in a day, if my experience with them is anything to go by. Some of the lowest rates, and it seems the followers I got are almost in the same line. My search for social proof ended on their site. The world would never have taken note of me, had I not had a great following on social media, and for this case Twitter. I placed an order for Twitter followers and they gave me the numbers. Much appreciated. Looking at my Twitter business handle and the numbers are lively after ordering followers from their site. I haven't looked back over the last one year. I realized that after buying followers from their site, the added numbers made my business look more legit and I was relieved. You make your order and they deliver the Twitter followers and that's great. They're cheap as their name, and this as well means that the followers may begin unfollowing mysteriously. I lost roughly 30% of 5k followers.